包建平, 王志峰, 朱翠山, 汪立群, 陈琰, 周飞. 柴达木盆地东坪地区一类新的原油及其地球化学特征[J]. 沉积学报, 2018, 36(4): 829-841. BAO JianPing, WANG ZhiFeng, ZHU CuiShan, WANG LiQun, CHEN Yan, ZHOU Fei. 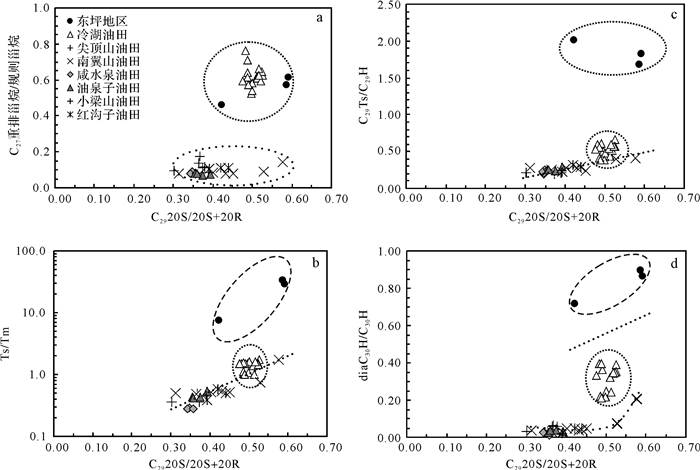 A New Kind of Crude Oils and the Geochemical Characteristics in the Dongping Area, Qaidam Basin[J]. ACTA SEDIMENTOLOGICA SINCA, 2018, 36(4): 829-841. Abstract: Based on compositions of various biomarkers, the crude oils from northern Qaidam Basin have relatively higher Pr/Ph ratios (>2.0), moderate contents of rearranged steranes (diaC27/reC27=0.5-0.7), rearranged hopane (diaC30H/C30H=0.2-0.4) and neohopane (C29Ts/C29H=0.4-0.7), and lower gammacerane (gammacerane index < 0.05), consistenting with depositional environments of Lower Jurassic source rocks. However, the crude oils from the north oilfields in western Qaidam Basin have the characteristics of lower Pr/Ph ratios (< 0.8), lower contents of rearranged steranes (diaC27/reC27 < 0.1), rearranged hopane (diaC30H/C30H < 0.05) and neohopane (C29Ts/C29H=0.2-0.4), and abundant gammacerane (gammacerane index=0.4-0.8), which may relate to saline source rocks. The crude oils from the Dongping area have a completely different biomarker assemblage from the two kinds of crude oils mentioned above in the study area, that is, abundant gammacerane (gammacerane index=1.2-3.0) coexists with high rearranged steranes (diaC27/reC27>0.4), rearranged hopane (diaC30H/C30H>0.7) and neohopane (C29Ts/C29H>1.5). It is very difficult to be explained by the distributions of gammacerane, rearranged steranes, rearranged hopanes and neohopanes in geological samples, because occurrence and formation of abundant gammacerane, rearranged biomarkers and neohopanes require completely different geological conditions. 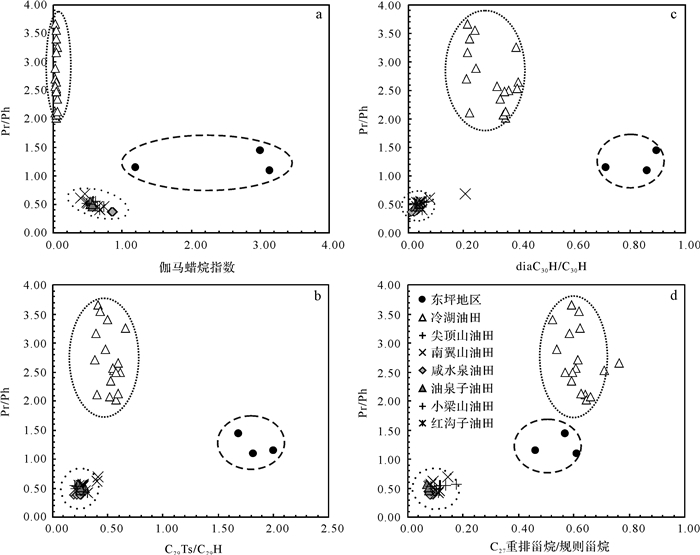 Furthermore, the relative compositions of various biomarkers in different crude oils from the study area suggest that this unusual biomarker assemblage in crude oils from the Dongping area is not from mixing of different crude oils, but an objective geological phenomenon, although its generation condition and geochemical significance remain unknown at present. Therefore, the crude oils having unusual biomarker assemblage are a new kind of crude oils in the Qaidam Basin, and their source rocks are probably deposited in an acid and saline environment. ten Haven H L, de Leeuw J W, Sinninghe Damsté J S, et al. Application of biological markers in the recognition of palaeohypersaline environments[M]//Fleet A J, Kelts K, Talbot M R. Lacustrine petroleum source rocks. London: Blackwell, 1988: 123-130. Philp R P, Gilbert T D. Biomarker distributions in Australian oils predominantly derived from terrigenous source material[J]. Organic Geochemistry, 1986, 10(1/2/3): 73-84. Moldowan J M, Sundararaman P, Schoell M. Sensitivity of biomarker properties to depositional environment and/or source input in the Lower Toarcian of SW-Germany[J]. Organic Geochemistry, 1986, 10(4/5/6): 915-926. Mello M R, Telnaes N, Gaglianone P C, et al. Organic geochemical characterisation of depositional palaeoenvironments of source rocks and oils in Brazilian marginal basins[J]. 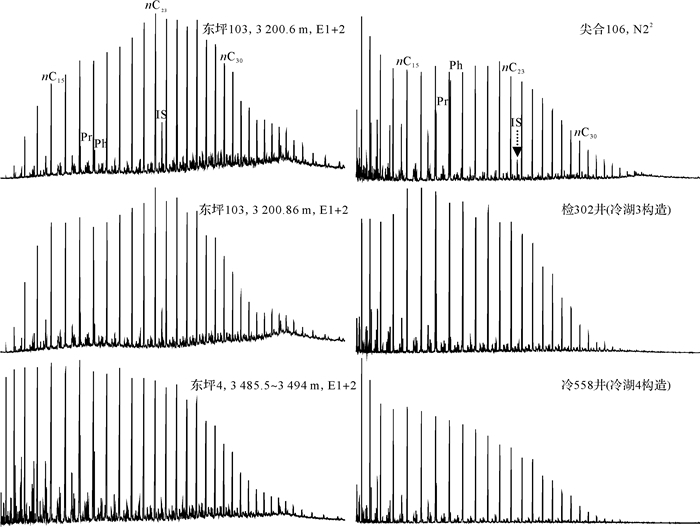 Organic Geochemistry, 1988, 13(1/2/3): 31-45.